The last Castleberry Faire of the year (for me at least) was this last weekend, starting on Black Friday. Clearly I only have an n of 1, but the crowd volume on the weekend after Thanksgiving is weird. Friday and Saturday were steady, with perhaps a little swell toward noon on Friday. And Sunday was just dead... I spent more time trying out the food that was on sale nearby than selling. Very odd. Usually, traffic is pretty predictable. There will be the early birds on opening day–these people are on a mission, and you've got to be ready, because they will buy. Saturday will have a small lull in the afternoon, and Sunday will be very slow until noon, but then will be steady. If you're wondering why I send so much time thinking about traffic, there's a good and simple reason- bathroom breaks when you're by yourself are a tricky business. The last of this year's Castleberry Fairs and Festivals is happening this weekend! Three day show, starting on Black Friday: I suggest you stop by sometime Friday, rather than sometime Sunday. This isn't because my inventory will be denuded by Sunday (although this is true) it's because I will have subsisted entirely on sugar and caffeine for the last two days, and so my conversational skills may be... unique. This is an indoor show, and that is a lot more fun than waiting in Black Friday lines! I'll be there with a ten-foot frontage of chainmail jewelry and purses. My first NaNoWriMo isn't going well exactly, but my story is absolutely progressing. 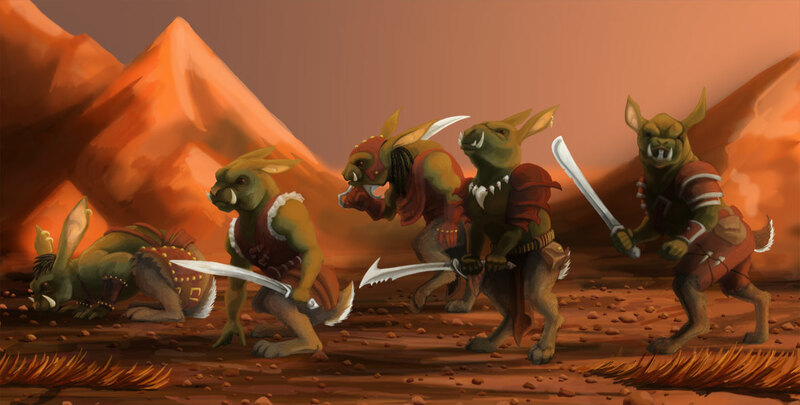 One of the most encouraging developments has been the fleshing-out of my villains. When I started I had some idea of what they wanted, but very little of the why, and even less of what they looked like. As my eventual plan is probably to draw this story up into a graphic novel, the visual vagueness of these two very important characters was a serious problem. Her name (at least until I decide to change it) is Ethelinda. He is Ofure. This is a picture of them in younger, happier days. At this point they are the heroes of their own story, not the villains in someone else's. This post is an official followup to my lightbox tutorial, because as soon as I finished my awesome box, I realized it was very... stark. Stark is my natural inclination, because that is exactly how I was taught to photograph fine art. But it turns out that if you photograph grey/silver jewelry with no added color, it looks like you took a greyscale photograph. I'm artsy, but I'm not that artsy. Plus, taking a photograph on an endless white background takes away all sense of proportion. Giving the viewer a sense of the size of the object is really important, particularly with decorative items where an object of the same basic shape can range in size from tiny to titanic. So for the up-and-coming jewelry photographer, options are limited. Many people opt to try to put their pieces in realistic settings: on a jewelry rack or over a hanging dress for example. Others go the comparison route, and show the piece next to a coin or ruler. I find the first option distractingly busy and the second option soullessly utilitarian, so I had to come up with something else. Something with some consistency, but that won't look the same in every shot. That was classic, charismatic, colorful. Something that wouldn't break the bank, would stand out from other similar photos, and would be consistent with my geek-all-grown-up friendly branding. Clearly, I'm talking about booze. Sterling Silver Odd-Angles Byzantine Earrings, shown with a wet martini with extra olives. Martini glasses are particularly useful for earrings. Earrings, by their nature, hang. When I see a series of photos of a pair of earrings and not one of them shows them hanging, I start to worry that that photo isn't being shown for a reason. Like maybe the earrings only look good when held in place. Sure, it's a bit of a pain to get them to stop swinging, but it's worth it. Copper Persian Bracelet with Tigerseye Bead. Shown with a large Manhattan. Sterling Silver Byzantine Chain with a Large Agate, presented by a glass of small-batch raspberry mead. And finally, a glass is a lovely excuse for an off-center closeup. Not being centered is a great way to get attention in a pageful of jewelry photos. So, what are you guys doing with your lightboxes? An emergency has come up, and I in fact won't be doing Art on the Rocks this year- apologies to my Michigan fans! I'll be back next year. 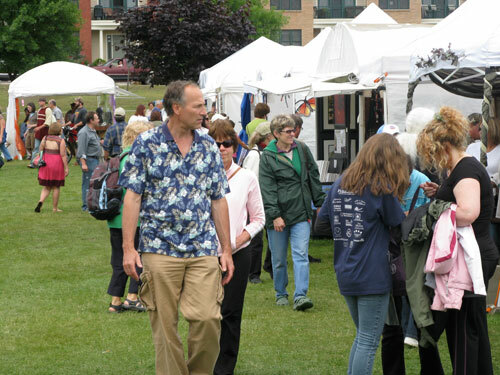 Art on the Rocks is Coming! It's that time again- the shipping, hauling, lifting, swearing, polishing, (did I say swearing?) time. But that's all just setup- the payoff is the show itself: reliable crowds, beautiful setting, and for once I feel like I have enough inventory! July 26th and 27th. If you're in the area, I'm sure I'll see you there! Pretty! But how did I get here? It started with these beads. Picked up from my new favorite bead store, I was intrigued by the complicated palette. Essentially green, but in a very naturalistic way. 'Green' in nature is hardly ever just one color- it's usually a welter of browns, blues, yellows and reds... as are these beads. but better with brass as well! From the shape of these beads I have two basic options: a necklace where the beads run end to end with some kind of chain in-between, or a bracelet where the beads are side-by-side, connected with chain on both sides. I'm going for necklace. From experience, I know that about a 3mm diameter size attachment will work with 18 gauge wire. But copper by itself looks a little sparse, so I'm adding a simple tiny brass link under the attachments to ease the transition between the metal and beads. My first thought was to use a single knot of barrel weave to divide the stones. But its not moving as freely as i would like, and more importantly the math doesn't work out- if I use this for the whole necklace, it will come out under 16 inches... too short. Byzantine. I do it all the time, but that's 'cause it works. In this case I get to play with colors, which helps this necklace stand out from its siblings. So I prep every stone with the links to make a single knot of byzantine. And then I can easily just connect the knots. Note the adjustment 'tail', which will be on the back of the finished necklace. Put it all together, make a hook clasp, and we're all done! Piece is for sale on my Etsy Page! After the Harvard Square Holiday Fair last winter, I decided I needed to up my interior booth display game. While my outdoor tent display has progressed nicely, my indoor version was still kind of just stuff on tables. Freestanding fabric walls are of course the classic solution to dressing up a booth, but given that A) really what I need was a visual divider between my booth and the next rather than something sturdy to hang inventory from (my tabletop displays do a pretty good job of being vertical all on their own) B) those fabric walls aren't nearly as portable as I would like- I rarely have minions, I need something I can set up quickly and on my own and C) my god man, the *price*. Maybe I'll get these after I purchase my own pony. 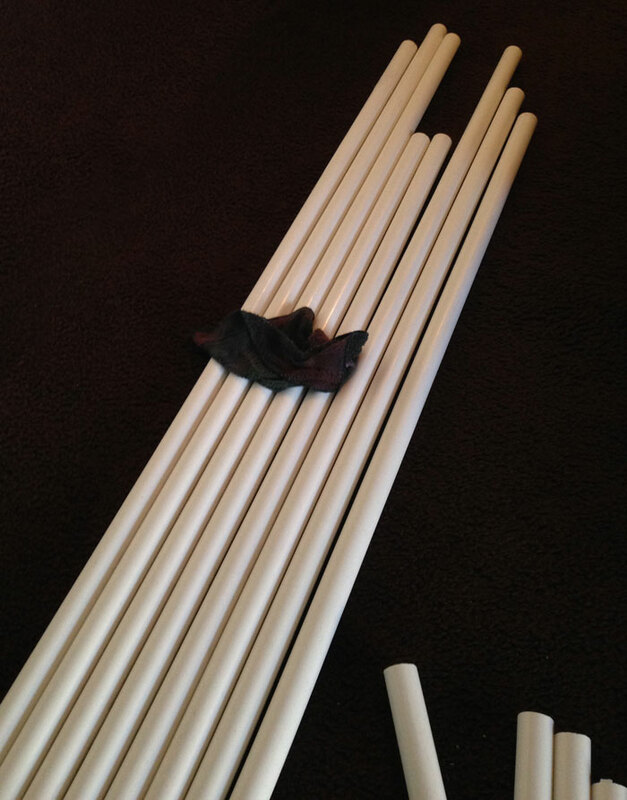 So after googling around, I decided the solution to my problem is PVC pipe. Otherwise known as Tinker Toys for grownups. I documented my build to share with you guys: it's a combo of this photography backdrop tutorial and this PVC cleaning tutorial, with a little improvisation. I'm pretty happy with the result for the price, so let's see if I can talk you through it! Always put your thoughts on paper. It's immensely helpful not only for working through your design, but also as a way to communicate with the hardware store staff who may or may not have any concept of what it is you're trying to make. Because I didn't need the fabric to be easily swapped out, I modified the original photography backdrop build to directly incorporate the fabric part, rather than having it draped over the top. I really liked the idea of being able to take it off and roll it up though as that seemed super portable, so I intended to preserve that ability. If this costs you more than $100, you've been had. Here is all the pipe, all laid out. I bought enough to make two dividers a the same time, so don't be intimidated by the sheer amount of piping. What's the hand-sander and particulate mask for you ask? Unfortunately, PVC comes with icky pink writing on it. Also various scuffs and marks from transit. Because the pipe will be visible in the final version of this build, this stuff has got to go. The most thorough, easiest, and fastest way to get rid of this crap is by sanding it off. If you don't have access to a palm sander a sanding pad/block from the hardware store will also work, and I think would still be faster than mucking about with acetone. All done! Wiping down with a damp shop cloth is a good idea, PVC dust is not your friend. I started by assembling the feet. I'd never worked with PVC before, so this was a nice confidence-building 'hey, maybe this will work' step. If you're only making one stand, you'll only need two feet. The two feet connected. This step uses all six of the 1ft lengths, one of the 5ft lengths, all the endcaps, and all the three-way joints. Connect the two longer vertical lengths together using the remaining 5ft length and the two elbow joints. If you hold each vertical with one hand, you can slot it in to the connected feet pretty easily. 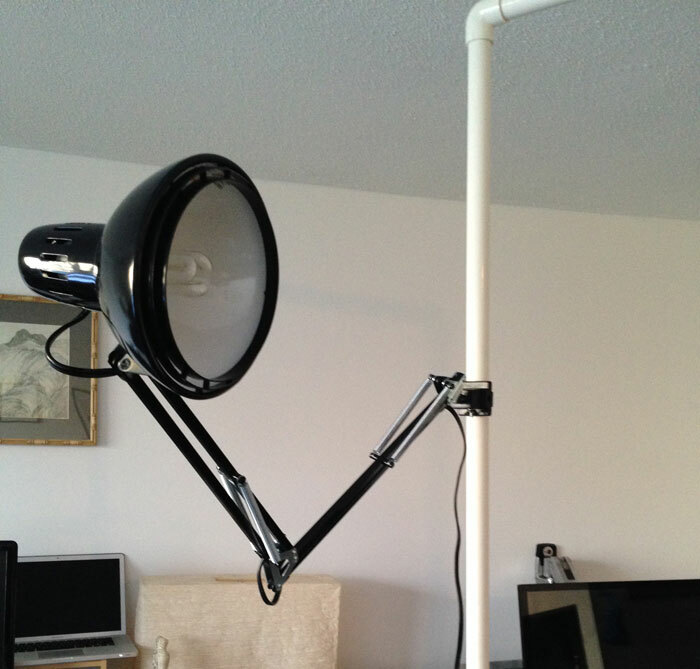 Crucial step: Even without using cement, the upright is strong enough to hold an elbow-lamp. If, like I initially did, you screw up and by fabric that is too narrow: Take your PVC apart and cut the two horizontal bars so that they're shorter than the width of your fabric. Remember the fabric has to cover the vertical bar and the join, which adds a little more than the bar alone. If the fabric completely covers the PVC, that's fine, so err on the side of cutting shorter. My initial plan had been to make another tube to thread the bottom horizontal bar through, but I ran out of time. Instead, I dashed out and bought some rivets and string. I put the rivet just to the inside of the vertical bar. And just above the bottom horizontal bar. Tied firmly with the string, it makes the canvas hang nice and taut, and adds a bit of stability to the whole piece. One vertical, disassembled. Fits under a bed or in a closet for storage, and easily in a regular size car. Plus, one person can carry and assemble it. And here it is in action, creating a nice visual barrier between my booth and the blanket-seller next door. It was sturdy enough that my neighbor asked if she could hang a blanket from it! 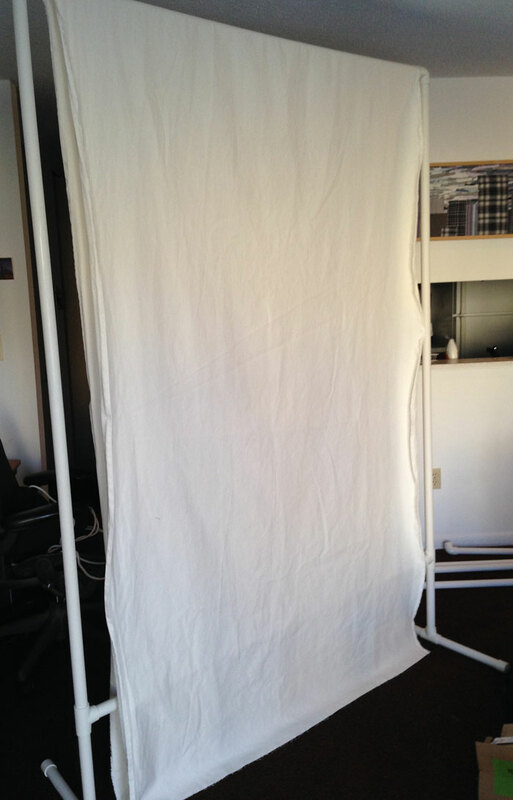 While I wouldn't want to trust it with much more weight than a lamp and a blanket, this divider does the job of defining my booth space for a price i can actually afford. 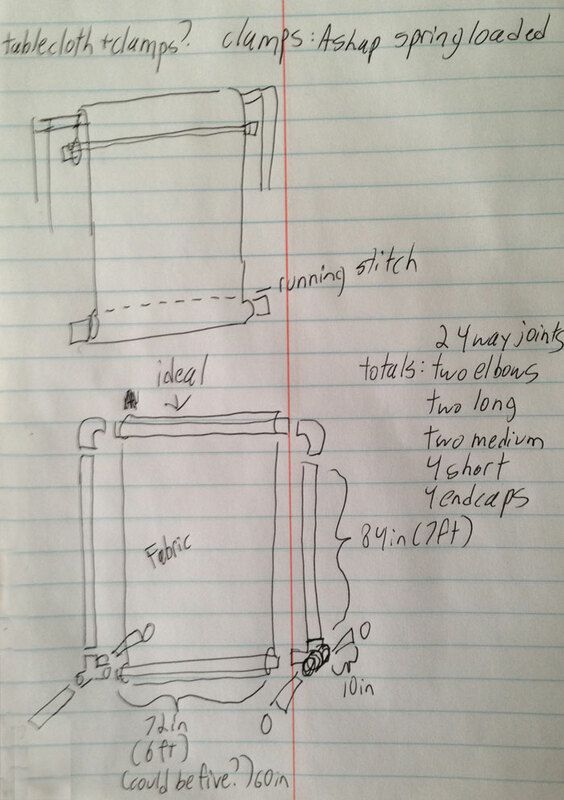 PS: I have plans to try connecting the two uprights I made into a single corner piece at an upcoming show. Because of PVC's Tinker-Toy qualities, this be as easy as picking up a couple new joints. I'll let you know how it goes! I'd don't draw a lot of straight-up humans, but for some reason when I read this prompt, I had a full composition spring to mind. I have a character, her name is Thunder Hallen, she's Hufflepuff quddich seeker. But I can't draw people for the life of me! Description of her: Shoulder length brown/red hair, blind, blue-green eyes, Quddich number "52." Request: Can you draw her in the quddich field, on a broom, during winter, with the snitch in the background. I did indeed need to ask for a few more details (mainly her age, build, and whether cloudiness in the eyes would make sense as a way to show she's blind) but for the most part my original idea is what I what ahead and executed. Background: Oh dear. This was I think my first attempt at a full background in quite some time- Which means I'd changed the techniques of how I paint enough that it was essentially like doing a full background for the first time. For things on the ground I did a very preliminary sketch, and then basically just did the edges in detail. Very useful, saves a lot of time! The clouds were... well, my first attempt at realistic cumulous clouds. Pretty good for a first try, but it's more the idea of clouds than how they actually look. The bleachers were a stretch, and it didn't go well. My attempt at canvas texture sort of backfired, and I was handicapped by not looking at any actual bleachers. Composition: Better than usual! Totally accidental though, so I can't take too much credit for it.